Stephen Woods pitched his second consecutive no-hitter with four walks and 14 strikeouts in leading Half Hollow Hills East to a 13-0 win over Whitman Tuesday in Suffolk League III baseball. He also went 3-for-4 with two RBIs and a run for the Thunderbirds (7-2). Whitman is 3-6. The righthander threw his first no-hitter in an 11-0 win over Central Islip on April 9. Garden City 15, Great Neck North 0: Cory Fallon set a school record with three home runs for Garden City (7-1) in a Nassau A-I/A-III crossover. Fallon broke the Trojans' single-game record of two homers, which was shared by several players, according to coach Rich Smith. The senior went 4-for-4 with seven RBIs. David Butler allowed two hits and struck out nine in five innings to earn the win for Garden City. 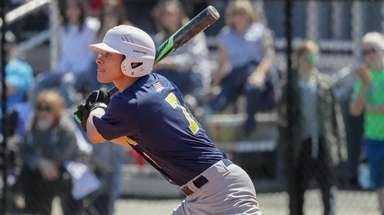 Shoreham-Wading River 14, Amityville 0: Brian Klemfuss (five innings) and Kevin Pimentel (two innings) combined for a no-hitter for Shoreham-Wading River (5-3) in League VII. Klemfuss struck out six, walked none and had one runner reach on an error in five innings of relief. Pimentel started and pitched two perfect innings with five strikeouts. Chris Moran went 4-for-5 with five RBIs.Sachem North 15, Lindenhurst 7: Anthony Palermo went 2-for-4 with eight RBIs to lead Sachem North (5-5) in League II. His three-run homer put the Flaming Arrows up 10-7 in the fifth inning and he hit a grand slam in the sixth. Steven Foster went 2-for-2 with three walks, three runs and an RBI. Copiague 7, North Babylon 6: Chris Falci stole home in the top of the seventh for the winning run for Copiague (2-5) in League IV. Copiague's Justin Scarione was 2-for-3 with three RBIs, including a homer that tied it in the sixth. Floyd 4, Longwood 3: Tyler Gerena's two-out single scored Chris Faison (2-for-4) in the bottom of the seventh for Floyd (6-3) in League I. Nick Russo threw a complete game and went 1-for-3 with an RBI. Chris Russo and Anthony Lazar each hit solo homers for the Colonials. Mepham 4, Valley Stream Central 3: Dylan Stock's walk-off single scored Shane Agostino for Mepham (7-3) in AA-III. Stock was 3-for-4 with a triple and two RBIs. Danny Paradise pitched four scoreless relief innings for the win.Floral Park 3, Bethpage 2: Kevin Jakinobich hit a sacrifice fly to score Mitch Calandra to cap a three-run fifth inning that gave Floral Park (5-2-1) a 3-2 lead. Nick Fetter gave up four hits and an earned run in six innings. 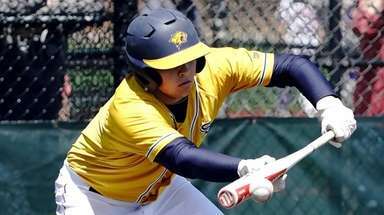 Holy Trinity 8, St. Anthony's 7: Frank Emanuele (2-for-4, two RBIs) hit a two-run double in the top of the fifth to score the winning run in CHSAA. Patrick Madigan was 2-for-3 with a homer and three runs, and pitched four scoreless innings for the victory. Donald Crispyn had a three-run homer for the Titans (7-1). 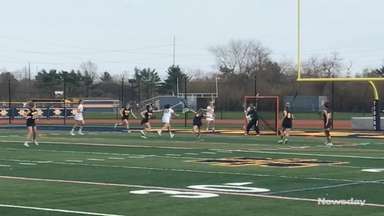 SoftballMassapequa 5, East Meadow 4: Rachel Sieber's RBI single scored Allie Dananberg with the go-ahead run in the sixth for Massapequa (2-3) in AA-I. Darby Pandolfo went 1-for-3 with an RBI. Renee Vaiano allowed six hits and struck out nine in a complete game for the win. She also homered in the third inning. Division 3, Mineola 2: Taylor LeBright scored the winning run on an error in the bottom of the seventh for Division (2-2) in A-II. LeBright's bunt, and a subsequent fielding error, allowed Julie Weidler (2-for-4) to score the tying run on the same play. Cheryl White was 1-for-3 with an RBI. Taylor Rosenthal allowed six hits and struck out six to earn the win. Freeport 9, Uniondale 8: Kaitlyn Frey's solo homer in the top of the eighth inning won it for Freeport (4-1) in AA-III. Frey was 3-for-5 with three RBIs. Uniondale had rallied for four runs to tie it at 8 in the seventh. 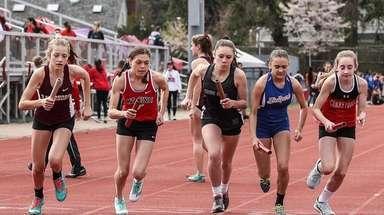 Taylor Miller was 3-for-4 with a homer and two RBIs, and Kaylinn Ellis was 3-for-4 with a homer for the Red Devils.MacArthur 6, Long Beach 1: Jena Cozza went 3-for-4 with two homers and three RBIs to lead MacArthur (2-2) in AA-I.Mepham 6, Oceanside 3: Tonimarie Valeriano pitched five scoreless innings of relief, allowing one hit and striking out 12 to lead Mepham (4-1) in AA-I. Alexis Ferrero went 1-for-2 with a pinch-hit, two-run single in the fifth that gave Mepham a 4-3 lead. Smithtown West 5, Riverhead 4: Kassie Furr drew a walk-off walk to drive in Sam Morganelli in the bottom of the seventh for Smithtown West (4-3) in a League III/IV crossover. Half Hollow Hills West 3, West Islip 2: Francesca Casalino struck out 12 in a complete game to lead Half Hollow Hills West (5-1) in a League III/IV crossover. Lexi Kleet's RBI single gave Hills West a 3-2 lead in the third inning. Newfield 3, West Babylon 2: Marissa Seigel's RBI single scored Erin Dimola in the first inning to give Newfield a 3-0 lead in a League III/IV crossover. Dana Reimann's two-run single had put the Wolverines (2-5) on the board. Ashley Kobrin allowed four hits and struck out eight in the win. Whitman 2, East Islip 1: Kelly Eng (3-for-3) singled to score Laura Galligan in the bottom of the sixth to give Whitman a 2-1 lead in League III. Galligan was 2-for-3 with an RBI for the Wildcats (2-5). Jenna Piromalli allowed six hits and struck out five in a complete game to earn the win.